All birds are raised outdoors with continuous and unrestricted daytime access to paddocks that are suitable for grazing and are provided with shade and shelter. All birds must use the paddocks each day unless; they choose to shelter because of inclement weather or short term confinement for veterinary treatment. Feed supplements are available to ensure all their nutritional needs are met. Birds are kept at a stocking intensity that will ensure forage is always available in an actively managed rotational grazing system. Pastured eggs and chicken are the true measure of ethical and sustainable egg and meat production. 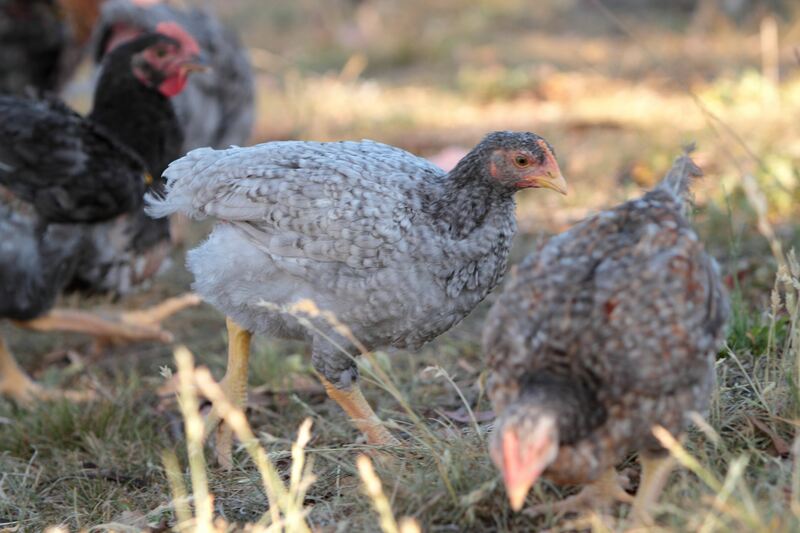 Raising poultry in the outdoors is nothing new, it has been practiced for centuries and it wasn't until around the 1950's that intensive, housed production systems were born. Pastured farming is a little old fashioned really but that's just the way we like it and given the rise in demand for free range pork, eggs and chicken, so does the consumer! Taste the difference! A more natural diet and environment shines through in flavorsome, wholesome pastured eggs and chicken. There is a lot of discussion at the moment about just what free range means when it comes to eggs. We would like to help wade through all of the confusion so that you can make a better, more informed choice the next time you buy free range eggs. Its easy, look for Pastured eggs instead! Firstly, we are assuming that, like us, you believe free range eggs should come from hens that have been able to range outdoors on pasture and encouraged to do so with plenty of shade, shelter and protection from the elements and predators. We also believe in smaller flock sizes and do not think that industrial sized sheds with little 'popholes' to the outside world are sufficient to meet the hens needs. We would like to believe that the land on which the hens range is managed sustainably too and will not put our environment at risk. Pastured eggs cost a bit more to produce so price is a good guide to authenticity of label claims. There's that old saying ' you get what you pay for' and it generally applies to free range eggs too. If the eggs are cheap, say $3.99 or $4.99, there is a good chance that they were produced under more intensive conditions. Generally, large supermarkets buy on price so while there is a vast array of names and claims on their shelves, there is usually not a true free range option for customers. Tell them YOU want a real choice. Farmer's Markets, Fruit & Veg Stores, local Butchers and independent Grocers are far more likely to stock free range pastured eggs. What will you be getting if you buy a supermarket brand? Probably eggs produced under an 'intensive free range' system meaning that the hens had theoretical access to the outdoors and were kept in large sheds, perhaps up to 30,000 birds in each. The birds can be stocked at 10,000 per hectare with no legal requirement to actually go outside. If you believe that an intensive free range egg is better than a caged one, and you don't mind paying extra for it instead of a pastured egg, that's your choice to make and that's why we need more transparency in the egg industry so that people can make the choice that suits their needs, not those of the egg industry or the supermarkets. Would you like PROOF that the eggs you are buying are free range? Visit our farmers and support true free range egg farmers - those that produce pastured eggs. Seek free range certification with a focus on outdoor production and not sheds with no range access.